The Danish Society of Medical Genetics (DSMG) is organized in Nyborg, Denmark on April 5-6. This year, the event covers the latest discussion around genome editing and treatment of genetic disorders. CRISPR/Cas9, gene therapy in ophthalmology and genetic treatments for spinal muscular atrophy will be discussed. See the event program here. How does in-depth understanding of difficult-to-sequence regions enable improved patient outcomes? Our clinical development manager Johanna Sistonen covered the recent advancements in the genetic diagnostics of X-linked retinitis pigmentosa and spinal muscular atrophy in a webinar titled Shedding light on complex regions in genetics. 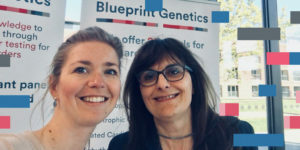 Meet with Sales Directors Maren Homfeld and Paola Longati to discuss what to consider when choosing a high quality whole exome test for your patient, or to hear more about our customizable NGS panels with easy expansion to WES. Book a meeting in advance or look for us there!